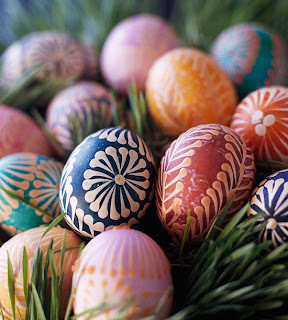 Being whimsical is all about being fun, fresh, and festive. 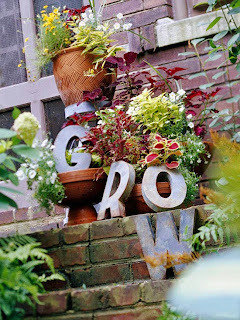 In this garden display, tin letters deliver a welcoming message for plants and visitors alike. 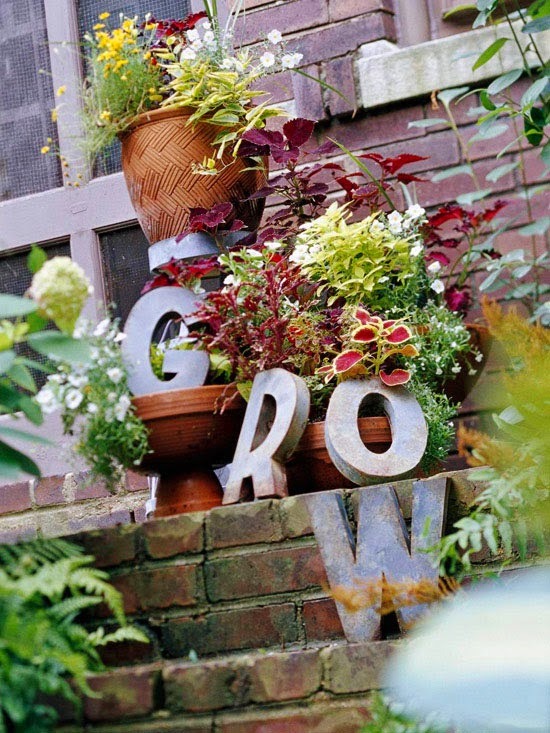 Note how the arrangement of the letters emphasizes the waterfall-like flow of the container plantings. Design Tip: Whimsical messages can elicit smiles. Make your own from tin, plastic, wood, or other weatherproof letters. Or scour flea markets for old signs that suit your sensibilities. 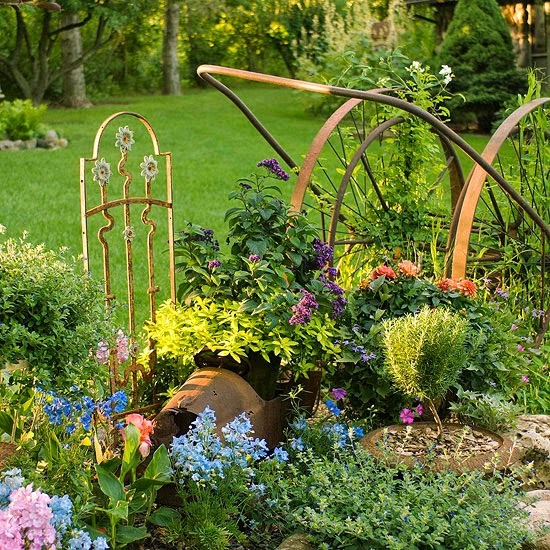 Part of getting motivated to incorporate your own whimsical landscaping design ideas is figuring out how to use items as vignettes to draw the eye or create a focal point. Repetition of similar pieces is one visual trick; here, a grouping of old watering cans, tilted in the same direction, adds a fun, festive face to a shed wall. Design Tip: Create motion in your display by giving things a tilt. These watering cans look ready to douse the nearest bloom and, as a result, imply a sense of motion. Repurposed items such as bathtubs, toilets, and cinder blocks are great for container gardens. 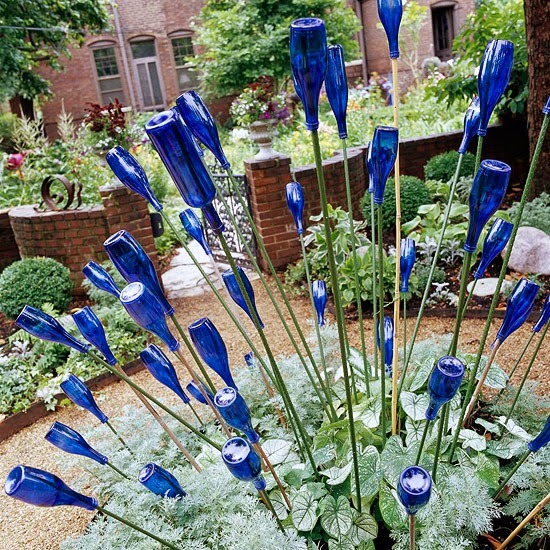 They're also unexpectedly striking garden accents that are sure to draw smiles. 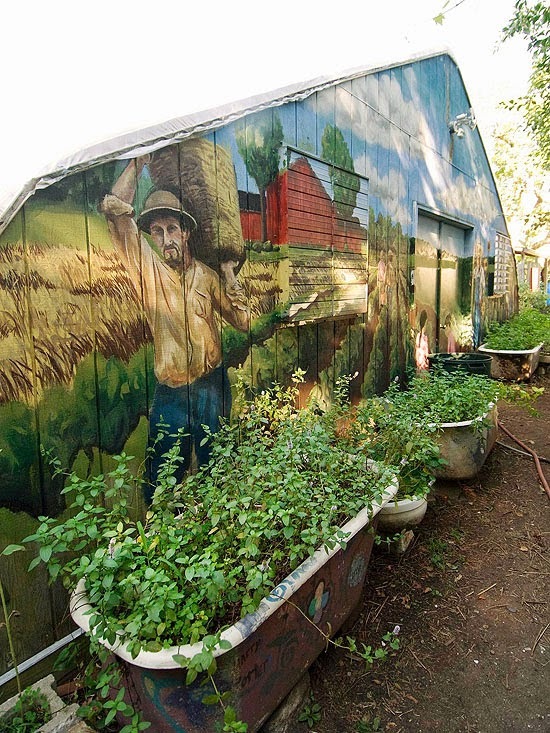 Use them for growing vegetables, edible flowers, and culinary herbs to add to your harvest. More Ideas: Fill up bicycle baskets, toolboxes, jugs, galvanized containers, buckets, ceramic bowls, old pots, and enamel tubs. 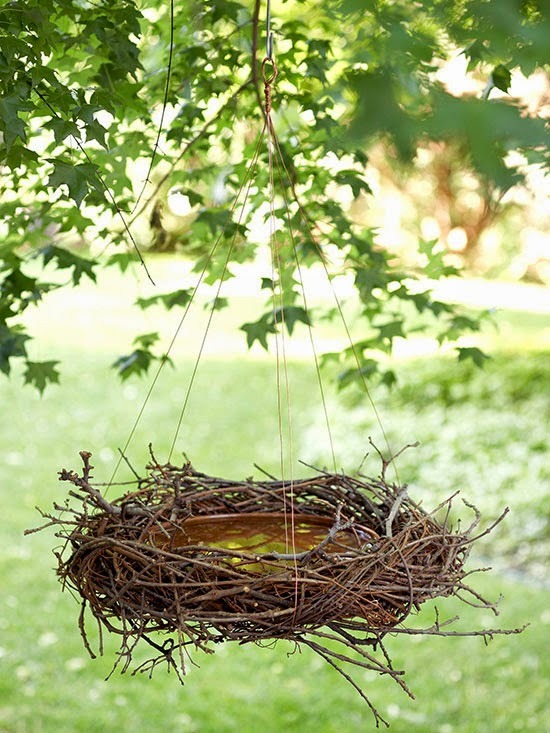 Ordinary grapevine wreath can give an interesting organic twist to a variety of garden elements, including a birdbath. Here, grapevine is twisted around a shallow ceramic bowl. Loops of copper wire suspend the birdbath from a branch. Twigs tucked in here and there add to the natural look. Design Tip: Position your birdbath so you can enjoy it both indoors and out. The view of birds splashing in the water can warm even a winter day. 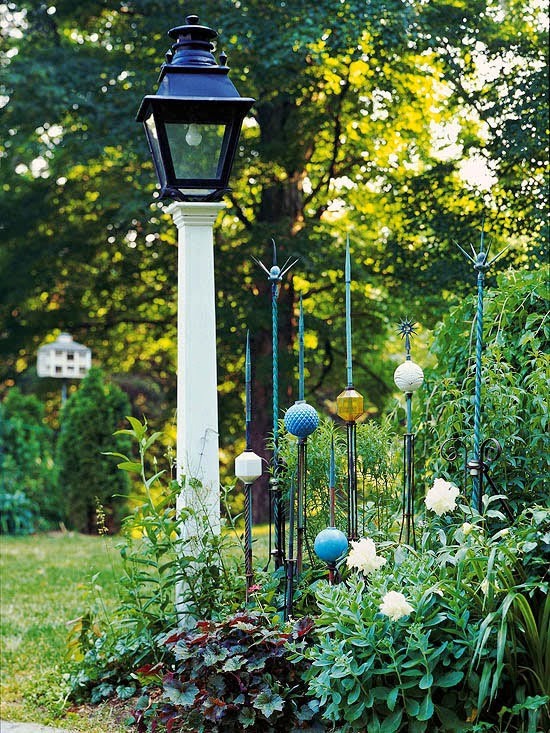 If flowers can't provide the color you want, whimsical landscaping design ideas might do the trick. Here, a collection of blue bottles adds pop and vibrance; the collection resembles a cloudlike sculpture. Design Tip: Insert color in uncommon forms. Arrange bright-color bowling balls along a path. Coat old garden tools with a vibrant hue and tuck the collection beneath a group of ferns or hostas. Create an edging of bright tiles along the perimeter of a foliage grouping. 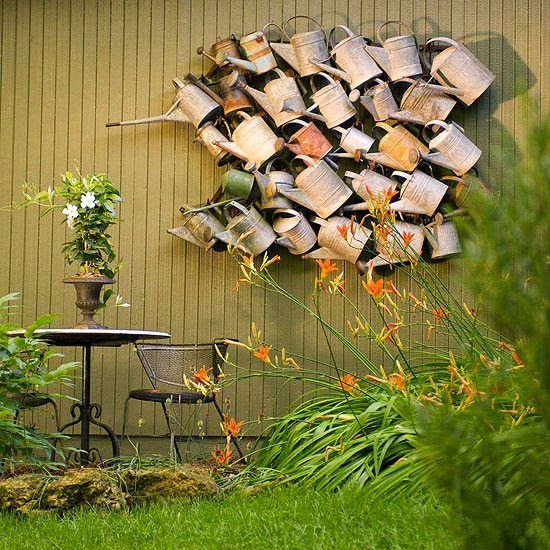 Other people's trash can become your unique and whimsical landscaping design idea. 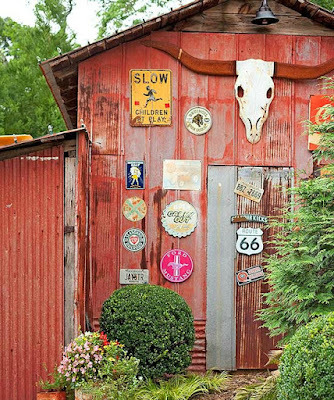 This homeowner found inspiration in old water-spigot handles and brass garden nozzles; she used them to decorate a piece of barn board on a potting shed for sculpture that dresses up the wooden building. More Ideas: Arrange a group of glass bottles to catch light, hang garden hand tools to focus on their shapes, arrange broken ceramic pieces in a mosaic, or hang nuts and bolts as a mobile. Retired garden gear makes a great addition to the garden. 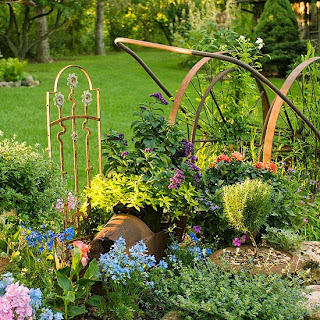 For an easy-to-plant whimsical landscaping design idea, roll an old wheelbarrow into a corner or curve in the garden, and plant it with a pretty collection of same-color flowers. 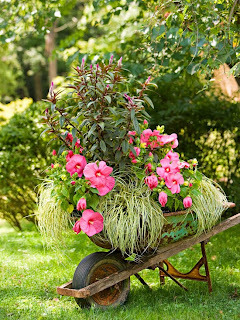 The portable nature of the planter makes it possible to move to make the wheelbarrow even more of a focal point for special occasions, such as a garden party. Planting Tip: Line metal vessels such as wheelbarrows with heavy-duty plastic. If there's a rusted hole, pull the plastic through and snip a hole for drainage. Then fill with potting soil. Whimsical landscaping design ideas often come from found bits and pieces. Grouped together, those items have impact. 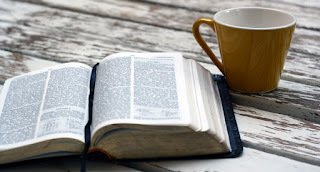 It doesn't matter that they were intended for completely separate purposes. Here, a fire-hose winder, a rusted children's pedal car, and a fencing fragment add texture to a collection of pretty flowers. Design Tip: Use material, color, and shape to create cohesiveness among disparate elements. For example, the rusty color and curved shapes of the pieces in this grouping bind the scene. Before you trash those old garden gloves, consider them a display-worthy badge of honor. This wooden fence got a fabric-focused accent with the display of a variety of worn-out gloves. Design Tip: Arrange colors and patterns to create smooth movement through a linear display. A fence naturally leads the eye in one direction. 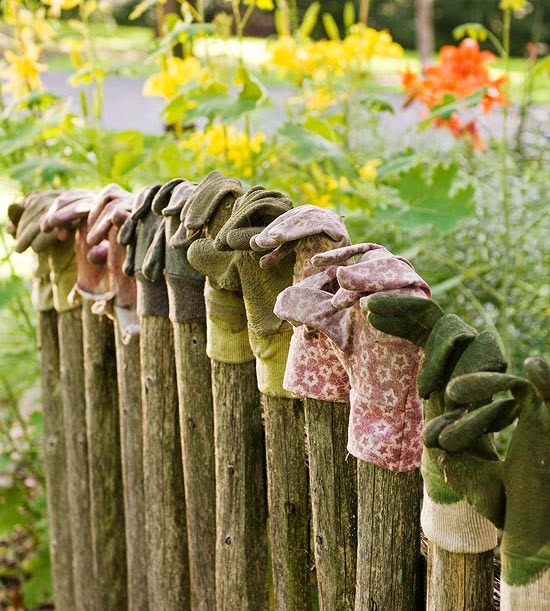 Display your gloves or other fence accents so the eye follows the linear flow. Nearly every garden has must-haves -- paths, edging, and mulch, for example. Whimsical elements can turn these essentials into personality statements. 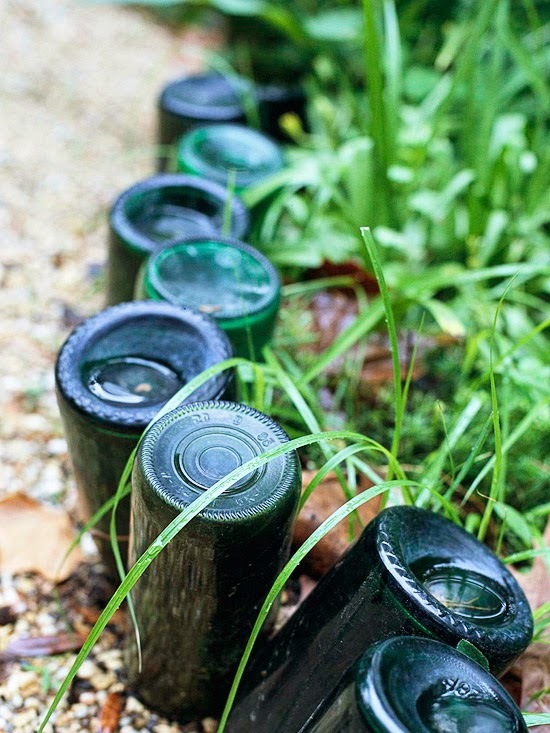 Here, blue bottles are recycled into striking edging. Repurposing everyday items for unexpected uses places emphasis on their color, material, or design rather than the original intent. Design Tip: Mix and match. Every piece in your design need not be identical -- or perfect. Emphasize similarities and hide flaws through your placement of each item. Flotsam and jetsam -- wreckage or things cast aside -- become a stationary metal tree when grouped together on a tall pole with varied arms. Use different types of materials -- chipped porcelain, old wicker, rusted metal -- for surprising depth in the back of a flowerbed. Design Tip: Top your display with a shapely focal point. Just as on a Christmas tree, a starring object at the top leads the upward and allows a visual respite. Favorite plants may thrill with blooms, foliage, or color, but many lack in height. If that's the case, whimsical landscaping design ideas can help you integrate hardscape. 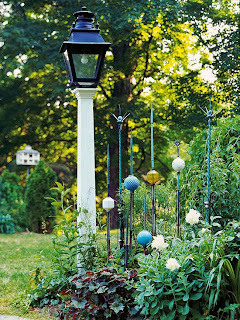 Here, a collection of lightning rods adds vertical dimension to peonies and perennial geraniums -- and it acts as a conversation starter, too. 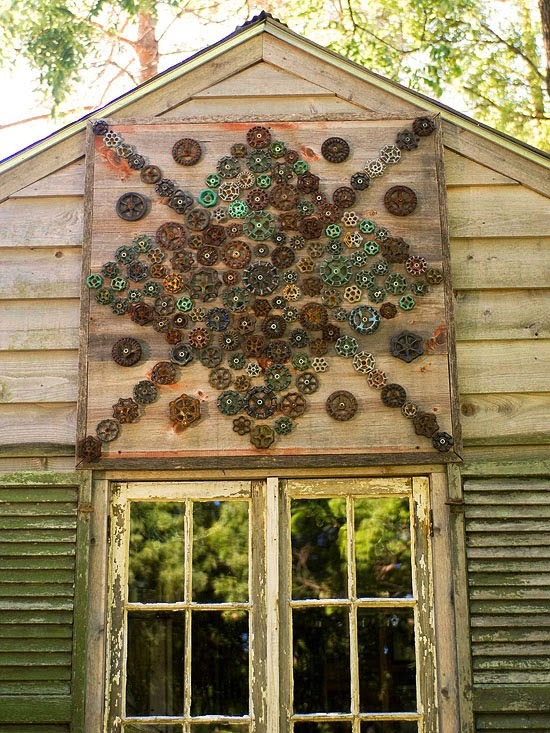 More Ideas: Arrange a display of whirligigs, windmills, columns, weather vanes, metal fence posts, or long-handle garden tools. 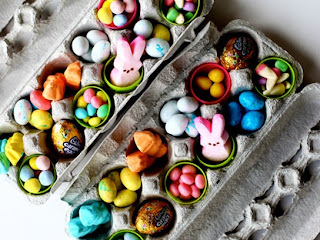 To maximize whimsical impact, think about how you can replace the ordinary and everyday with something unique. For example, mulch doesn't always have to be chopped-up wood -- especially in small spaces. 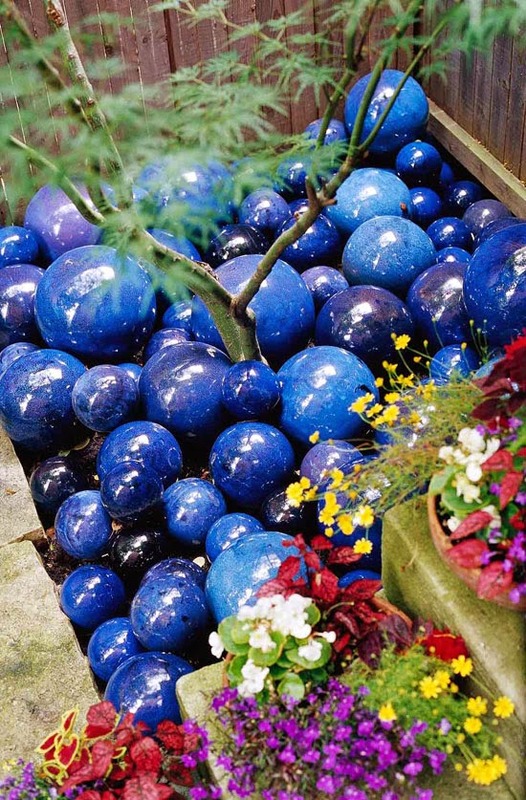 Here, a "mulch" of blue glazed ceramic balls brightens up the base of a Japanese maple. Design Tip: Be bold. 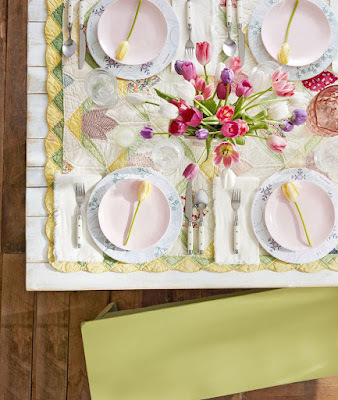 Half the fun of a whimsical focal point is the surprise. Pick a contrasting or complementary color and concentrate it in one locale. The results will be impressive. Create wonder and amazement. For example, no one really expects a hardscape garden element to soar above shrubs or container plantings to tower at tree height. But this collection of neoclassic columns does both, shaking loose traditional expectations of a garden. 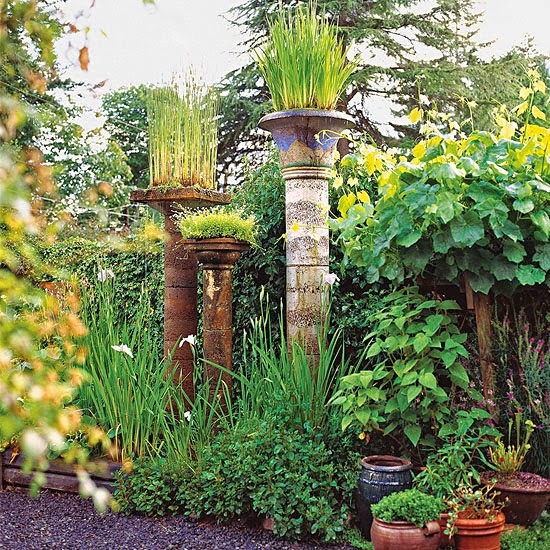 Planting Tip: To emphasize the vertical impact, choose plants with columnar or upright forms. Consider ornamental grasses that do well in containers. A plant with a mounding habit adds interesting contrast at eye level. 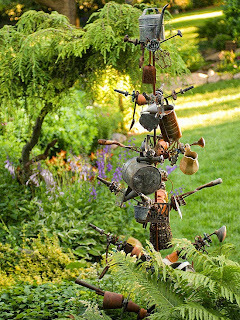 Most items are created with a particular use in mind; part of integrating whimsical landscaping design ideas is to turn that use on its head. 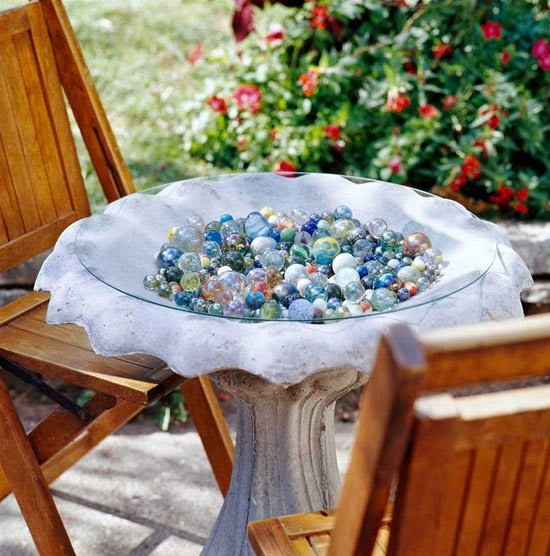 A birdbath becomes a spot to display a colorful collection of marbles. Covered with a piece of plastic or glass, the structure is a conversation piece that doubles as a small table. More Ideas: Make use of old windows or doors as tabletops, old folding chairs as plant stands, salvaged columns as lantern holders or plant stands, and flip-top mailboxes as flower vases.